It wouldn't be Mass Effect Week if we didn't link one more time to "Mass Effect Massive Interface Fail," game designer Krystian Majewski's incredible three-part takedown of the first game's awful user interface. It's a funny, damning, and wonderfully thorough analysis. 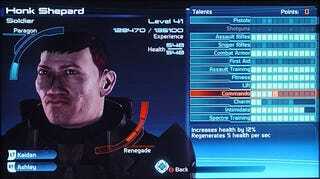 If you've never met Honk Shepard, now's the time.